By CHRIS KIRUBI, Last week I was invited to Abidjan to speak to members of the Private Sector and young entrepreneurs on the construction and emergence of National Champions. Young people no matter where they come from, have similar challenges that they face. Lack of capital, access to markets, patenting, lack of equal opportunities etc., are some of the common challenges faced by youth all over the world. Every young person has a dream to become successful in whatever career they choose. They hunger to be motivated, supported and mentored as they embark on their journey of success. It is only fair that those who have gone before them, those who are looked upon as mentors, successful persons in the corporate industry and national champions play their part in molding, assisting and inspiring young people. Anyone has the potential to become a national champion, but not everyone becomes one. More often than not, success is determined by the effort you put in using the knowledge and opportunities you have. When I speak of national champions, I speak of those who contribute to real economic transformation and impact the country positively whilst portraying success in their various fields. National business champions should be mandated to help grow businesses and investment opportunities in the country. When we challenge businesses to rise up to the role, we will be facilitating growth throughout every sector of the economy. We will be creating jobs and promoting opportunities across our country. When we create champions who in turn become the country’s ambassadors, we increase healthy competition internally and externally. As a country, we are able to position ourselves as an economic hub giving opportunities to those willing to progress and promote development. Kenya 7s, you have a role not only to wallow in the miasma of your success but to mentor and assist those looking up to you to be successful not only in rugby, but in every field. Success is success, whether in sports or in business. You have a role to play in shaping, encouraging and mentoring more youth. Even politicians have a role to play in this. They are the face of this country and are responsible for making and implementing laws. Some of them have even achieved success in their individual divides. As national champions, they have a responsibility to enhance security and promote stability so that businesses can thrive. As Kenyan national champions, we can assist the Government to tackle and provide solutions to existing problems. We have a responsibility to take part in the growth and development of this country as our patriotic duty to our beloved nation Kenya. I hope you will all join me in doing the best we can to impact this country in a positive manner. It is about time National Champions rose to this role. 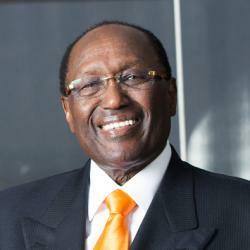 CHRIS KIRUBI Chris is a Kenyan industrialist and entrepreneur whose interests lie in insurance, media, manufacturing and more. His passion include empowering the youth in Africa.